Welcome to Victoria Pediatric Dental & Orthodontics! Our dedicated doctors and staff can’t wait to give your loved one a friendly and satisfying oral healthcare experience that leaves the whole family with new reasons to smile. Before you reach our Victoria, TX practice, we’d like for you to know some important information about what you can expect. If you have any questions or concerns about what you read below, don’t hesitate to contact us. First, you’ll need to check your son or daughter in at our front desk. They will alert the rest of our team to your arrival and gather any necessary information they’ll need. If you haven’t completed the new patient forms yet, you’ll be asked to do this before the appointment can begin. This way, we can have a full record of your child’s medical history and ensure that our approach is always safe and beneficial for them. If you’ve scheduled a pediatric exam, parents can expect this to last around half an hour. Our team will start by thoroughly cleaning your child’s teeth and teaching them about brushing and flossing effectively. Our pediatric dentist will thoroughly examine their mouth and determine if any treatment is needed. If you’ve scheduled an orthodontic consultation, this type of visit will last anywhere from 60 to 90 minutes. We will capture comprehensive X-rays of their mouth and get to work on planning out the ideal orthodontic treatment. If you’d like to speed up your time spent in the waiting room, parents can elect to complete the necessary paperwork beforehand! Just click on the link below to download all the forms you’ll need and print them out in your home. After writing in your information, all you have to do is turn them into our receptionist when you arrive, and your child’s appointments will be able to start smoothly. 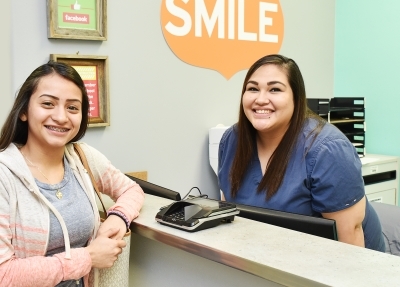 If you currently have dental insurance through a PPO provider, our practice will gladly accept it and work with parents so that they can maximize their available benefits for preventive dentistry, restorative options, and more. We enjoy being able to not only treat your child’s dental problems but also help prevent them in the first place! Any questions about what your personal coverage offers? Curious about what your financial obligations will be on your first visit? Call us today. Victoria Pediatric Dental & Orthodontics is a proud provider of both Medicaid and CHIP! We strongly believe that a family’s financial situation should never stand in the way of a child receiving the dedicated and high-quality oral healthcare they deserve. Our knowledgeable team members work closely with parents in order to help them arrange appointments in smooth and affordable ways. Victoria Pediatric Dental & Orthodontics now accepts online payments through our secure payment portal. To begin, click the button below, and you will be taken to a secure payment portal page. Your payment will be processed quickly and securly, with just a few clicks. If you have any questions, don’t hesitate to call our office.